Cervical cancer cases in Maryland nearly doubled from 1998 to 2002, and melanoma cases increased 70%. A Department of Legislative Services audit for the state of Maryland uncovered an explanation for the staggering rise in cancers. Maryland Cancer Registry data had been deliberately falsified to indicate that thousands of people had cancers, who didn’t. The number of cancer cases in a state’s registry is used to determine how much grant money it is awarded for cancer prevention, education, screening and treatment programs. Cancer registries are also used by the CDC and epidemiologists to look for correlations between cancers and diet, lifestyle behaviors and environmental factors. The Audit Report brought to light the sizeable degree that grant monies appear to contribute to fraud and misuse at government agencies. “There are some issues here that concern some big dollar amounts,” the auditor said. This tampering of cancer data wasn’t all the auditor found at the state’s Family Health Administration. 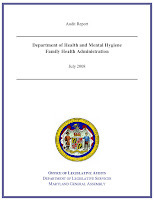 According to the Audit Report, the Family Health Administration (FHA) had awarded a contract for managing the Maryland Cancer Registry (MCR), the central database for all cancers in the state, to a vendor. The vendor had been contractually required to obtain national certification of the data from the North American Association of Central Cancer Registries (NAACCR), which it had failed to do for 2001 data and the data was never certified. The vendor had obtained certification for 2002 data, which had been submitted to NAACCR in 2004. But the data wasn’t reviewed by the FHA until a year and a half later. That’s when “critical MCR data under the control of the vendor was determined to be deliberately altered to indicate that numerous individuals had cancer when they did not.” The auditors specifically noted a more than a 90 percent increase in cervical cancer cases and a 70 percent increase in melanoma cases reported in the MCR for 1998 to 2002, but the vendor couldn’t or didn’t provide FHA with an explanation. The vendor also completed its own investigation and deemed that the MCR data (for 2001 and 2002) had been deliberately altered between August 2004 and December 2004. Specifically, over 13 percent of all cases in diagnosis year 2002 showed some sign of alteration, especially cervical, prostate, and melanoma cancer cases. The investigation disclosed that the changes were made after the cases were initially entered into the MCR by the laboratory facility or provider (such as, changes to the codes from non-invasive cancer to invasive cancer...). For example, in the 2000 dataset, 4 discrepancies between the laboratory/provider reports to the MCR data for prostate cancer cases were noted in comparison to 3,895 discrepancies and 3,248 discrepancies for such cases in the 2001 and 2002 datasets, respectively. The vendor concluded that these changes were methodical and were made by one or more persons with broad access to the system, and not a result of a random set of events. According to the State’s records, FHA’s fiscal year 2007 expenditures for the two programs totaled approximately $46 million, including $38.4 million in grant expenditures. Our review of five TUPCP [Tobacco Use Prevention and Cessation Program] local public health grants totaling approximately $6 million, disclosed that in four cases the grantees, which received grants totaling $4.7 million, did not meet specific performance requirements outlined in the grant application and FHA did not take any action... For example, one grantee that received a grant totaling $994,067 was to implement 14 secondhand smoke programs and educate 1,200 merchants on the youth access laws during fiscal year 2007. However, the grantee only implemented one secondhand smoke program and only educated 51 merchants. No follow-up action was taken by FHA and virtually all of the grant funds were paid out. Our test of two CPEST [Cancer Prevention, Education, Screening, and Treatment Program] local public health grants totaling $2.4 million disclosed that for one grantee that received a grant totaling $1,218,000, FHA reduced the performance measure to more closely align with the actual results. Specifically, this grantee was to educate 10,000 residents about prostate cancer, to perform 600 screening tests, and to perform 1,200 other prostate cancer examinations. These measures were reduced to 3,000 residents, 500 screening tests, and 1,000 other examinations after the actual results for the grant year were virtually known. The auditors also reported on the Breast and Cervical Cancer Diagnosis and Treatment Program, which pays out a total of about $12.6 million, finding “several deficiencies noted regarding the processing of BCCDTP claims.” In another example, the auditors said that FHA hadn’t accounted for $11.3 million in grants to Prince George’s Hospital in 2006 and 2007. For cancer patients and their loved ones, and consumers who might have been frightened by overstated cancer rates from the cancer registry, the false cancer data uncovered in this audit was more than about money. False information could misdirect researchers and policy makers to pursue interventions that are dead ends, while ignore potentially valuable cancer research. But more immediately, research has now been delayed, according to Maryland Health Secretary John Colmers, as they have been forced to go back and make sure years of data is accurate.